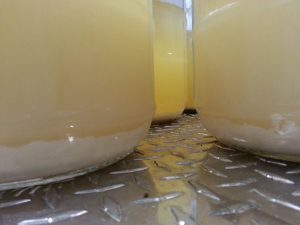 When harvest starts to come to a close, winemakers can strategically invest in holding onto the yeast sediment that develops after primary fermentation, or lees. The use of lees offers lots of production advantages, and depending on how fresh lees are kept, winemakers may find their use advantageous periodically throughout the production year. Some winemakers opt to keep lees available by retaining contact with their aging wines in barrel. Others may segregate lees into a separated holding vessel. Regardless of how one stores them, when using lees as a processing technique, it’s important to ensure that the lees is clean and does not give off any sort of off-aromas or flavors. Lees from heavily diseased fruit should be discarded.